Welcome to Day #9 of Chocolate, Holiday Spices and Maple Theme Week(s). 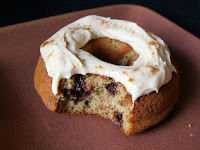 Today's Chocolate Chip Know Better Donut, from Know Foods (Atlanta, GA), looked a little lonely; so it received some homemade "frosting" (made of organic cream cheese, maple (syrup), cinnamon and spices). 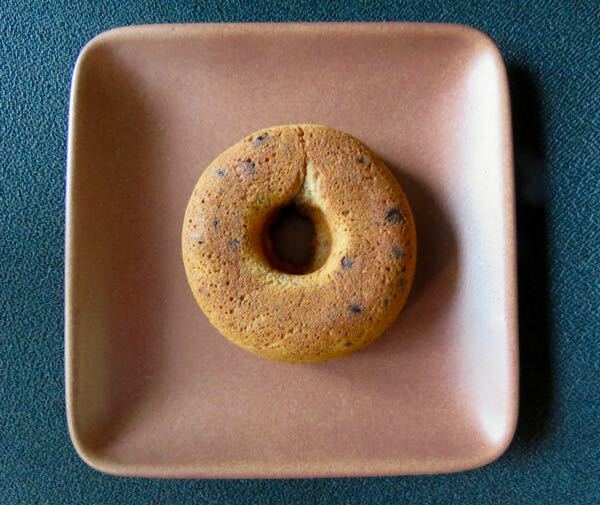 This baked good looked like a cross between a bagel and a donut, and appeared to be far healthier than most donuts, even with a rich topping. Know Foods is building a brand for itself based on products like these Know Better Donuts, billed as: "...natural, non-GMO, grain/gluten free*, high protein, high fiber, low carb and low sodium—and have a near zero sodium index..."
The company used Enjoy Life ("vegan, soy, nut, dairy and GMO free") chocolate chips in these donuts, and has plans to incorporate their own chocolate chips in the future.